An unfortunate effect of the shutdown is that thousands of interviews for foreign nationals on their journey to U.S. citizenship have been cancelled. These are people doing all the right things to fulfill a cherished dream—to become one of us. These genuine immigrants are today’s “dreamers,” but because of now chronic intransigence on the part of Democrats, their dreams are now indefinitely delayed. The reason is simple: When all is said and done, Democrats simply do not want to solve this issue. Two recent examples prove the point. The first occurred during the last two years of the GWB administration and first two years of the BHO reign when Pelosi was last Speaker of the House. 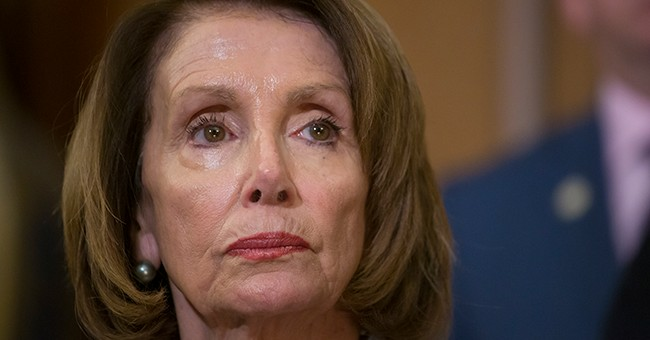 Now in her 17th term in Congress, she had a grand opportunity back then—even if she did not want to accommodate GWB’s immigration reform overtures—to fulfill a promise repeatedly made by her president on the campaign trail in 2008, but Democrats chose to forget their pledges to the undocumented millions when they had operational control of the government. Instead, they spent their political capital on the Affordable Care Act (you know—the one where BHO said, “if you like your doctor, you can keep your doctor” and Pelosi said, “after we pass it, we’ll have to read it to see what’s in it.”). Now we have another piece of evidence. On Saturday, January 19, President Trump offered both an olive branch and a face-saving compromise both for Republicans and Democrats alike. Money for immigration judges to hear asylum cases, more border agents, and temporary DACA protection in trade for selected barrier augmentation represented a basis for further legislation leading, possibly, to a firm and final resolution of the immigration issue. People everywhere, especially the 800,000 federal employees on furlough, waited for a Pelosi counter-offer. The president has Pelosi on the defensive and what crumbs she may toss on the table, exaggerated in value by her MSM lackies, will serve only to distract us from the Democrats’ embarrassing, stiff-necked non-feasance. Democrats—so-called Progressives, if one prefers—have two reasons for not doing their duty to all of us. One is they absolutely refuse to give a Republican president credit for solving the immigration problem—the nation be damned—and two is they see themselves better off politically holding Latinos in thrall to promises for future deliverance. The pattern is a familiar one. They continue to refuse substantive measures to help African-Americans lift themselves up on the economic ladder because they believe that successful, gainfully employed people will no longer vote for their handouts. What have they done to advance so-called Women’s Rights (an interesting question for a party that no longer recognizes gender)? Little, except to promote marches—accomplishing nothing—allied with racist, divisive sponsors like Louis Farrakhan. Many Americans, like this veteran, think our America is not just an idea, but a well-defined place. This magnificent earth bequeathed us by our forefathers has been furrowed by the blood, tears, and struggle of millions who have gone before us and sacrificed their everything on the altar of freedom so that this special place, our national home, continues as a noble bastion of bounteous liberty for all we choose to welcome within our borders. Democrats—perhaps, Regressives, if one prefers—no doubt protect their own behind locked doors and bolted windows. Some, like Pelosi and Obama, live behind gated walls and are doubly insulated from the madding world. What would they do if uninvited strangers simply broke into their homes and insisted upon sustenance, education, and shelter—and refused to leave. Such strangers might have knocked at the front door and asked for help, for sanctuary, but people who think anything is theirs for the taking—especially when their hosts/victims are perceived as having “more” than they have—rarely knock at the front door. So, what would our Regressive friends do? Smile and say, “Sure, just help yourselves”? Oh, no! They would indeed smile as they introduced their “guests” to us—you and me—and insist we shoulder the limitless burdens they choose to give us. Regressive Democrats seem not bound by our history, our culture, our Constitution. Beto O’Rourke and other brave new world-ers would have us abandon all for the regressive dream of dystopian socialism. The rest of us choose to protect our borders from those who threaten us. Unlike the walls erected around Communist countries to imprison their people, what barriers we choose to shield us also allow our people to go and return, bringing with them fresh breezes of new ideas, innovation, and prosperity. The people we choose to welcome into our national home—just as we would into our own homes—are those we believe will have similar values, those who will work alongside us to further our national dreams. Those waiting for their citizenship interviews, applying for Green Cards, or are taking whatever step to become one of us have all knocked at our front door, and seek nothing from us but the same welcome given my grandfathers in 1905 and 1913. These, “yearning to breathe free,” are the people for whom Emma Lazarus penned her famous words—not those who have broken into our national home by hook or by crook. Some insist President Trump should not have cancelled Pelosi’s flight overseas. He should have waited a bit, they say, and cancelled her return flight. On the other hand, had he run a chyron below his Saturday offer with the office phone numbers for Nancy and Chuck, and asked America’s silent millions to give him civil support for his proposal, Regressives might have put aside their destructive ideology for one moment to make all of us more safe and secure in our national home.